Grapes could be no more. Tuesday ushered in a new hockey television deal for Canadian hockey as Rogers Sportsnet and the NHL agreed to a historic 12 year, $5.2 billion deal to gain the majority of hockey media rights across Canada. Rogers also gains control of every single game in the Stanley Cup playoffs, including the Stanley Cup Final. CBC will still retain the important Saturday night spot and will still keep “Hockey Night in Canada”… sort of. Although CBC will still have “Hockey Night in Canada”, the network will make no money off of it and will have no creative control of the program meaning changes could be afoot and that could mean the end of the legendary Don Cherry. His future is still very much in doubt at this time and if Rogers truly wants to be a giant in the NHL, they must retain Don Cherry. Not only is he entertaining, but he is perhaps the most knowledgeable analyst on television, US or Canada. As a long time hockey player and coach, Cherry has seen it all and knows just about everything there is to know about the game of hockey and he passes on that knowledge every week on his “Coach’s Corner” segment. Cherry is very outspoken and very brash with his comments. He tells it like it is and he isn’t afraid to ruffle anyone’s feathers, not something you see very much on TV. Studio analysts today are more like talking heads, they are a dime a dozen and very replaceable. 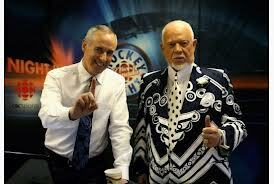 Also, in doubt is Cherry’s longtime sidekick, Ron MacLean. Cherry and MacLean have such great chemistry that cannot be rivaled. Not even close. MacLean plays a great straight man to the loudmouthed Cherry. They are both entertaining and very informative at the same time, again something you don’t see very much these days. If Rogers does replace the team of MacLean and Cherry with generic studio host A and generic former player B, they will be no different than any other network televising games except for the fact that Rogers had to pay $5 billion to televise. That’s my biggest fear with this is that the duo will be dumped in favor of company men that will completely bore us, but it’s Rogers right to do as they wish, after all they do hold the majority of the television and Internet rights for the NHL in Canada. However, Cherry can be controversial at times, something Rogers won’t like in year one of a twelve year deal. His comments regarding women in the locker room was met with much backlash, and rightfully so. If he goes on another controversial tirade, it could look bad for Rogers very early in a long term commitment. It’s important for Rogers to get a solid footing in their first couple of seasons as the premier of Canadian hockey on television. Cherry is a very popular figure throughout Canada, in fact he was voted as the seventh greatest Canadian of all time in 2004, beating out Alexander Graham Bell and Wayne Gretzky. Simply put, Cherry is a legend and will be virtually impossible to replace. 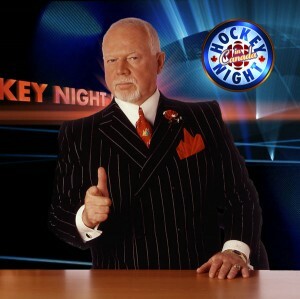 If this is Cherry’s last hurrah on television, may they hang his garish, plaid patterned suit to the rafters never to be worn again.